How can you defend someone you think is guilty? It’s a question all barristers have been asked, and asked frequently. The real answer is that the barrister is neither judge nor jury, but, sometimes it’s easier to give an example. ‘I’ll tell you about a case of arson, that’s setting fire deliberately to property. I was defending a fifteen year old, let’s call him Colin Smith, who was said to have set fire to a community hall attached to the school he attended. The case was due to be heard in the Juvenile Court in Seymour Street in central London. It’s a grubby building, could be any set of offices, but it smells of sweaty trainers. In the mornings the waiting area is crowded with kids, most of them wearing track suits and a dearth of parents. The ‘Women’s Voluntary Service do their best to provide teas and coffees and squash, no Coca Cola, for obvious reasons. My case was listed for the afternoon, when it’s much calmer. I arrived at court towing my bag with all my papers about half an hour before the justices were to hear my case. My client was sitting with his parents on one of the long benches in the hall. He was wearing his school uniform, looking throughly miserable, as well he might. His parents staring around them at the unfamiliar, worry etched across their faces, dressed as if going to a parents evening. The fire had been serious although no one was injured, just a lot of smoke damage. There wasn’t much evidence against him, but what there was compelling. His fingerprints had been found in a part of the building he would not have had any access too, but when the police had interviewed him, he had denied going into the premises. The prosecution case was that he had lied about going into the hall because he had started the fire. I knew from my instructing solicitor he refused to plead guilty to the offence. Both he and the boys parents had done their best to persuade him, but he claimed he was not responsible for the fire. I too tried to persuade him to change his plea to guilty, going over the evidence against him for what must have been the fourth or fifth time, but he continued refuse to accept any responsibility for the fire. As I went into court, I was a rather downhearted, anticipating a trial in which there was little I could do to prevent him being convicted and no doubt after reports prepared by the probation service, going to a young offenders institute. ‘Yes. Yes, it could. I can’t rule it out,’ he replied. I sat down quickly. I had done enough. Careless isn’t enough for the offence, it must be deliberate or with the realisation that a fire might result. Colin Smith was acquitted, and I was relieved he had ignored my advice. 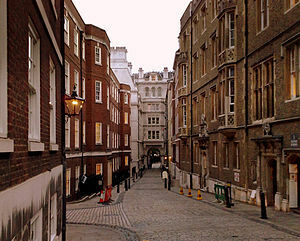 My protagonist of my novel Crucial Evidence is a barrister, Cassie Hardman, who has chambers in Inner Temple London. Chambers are the name barristers give to both the place they work and the group of barristers who share that accommodation and staff. Most sets of Chambers are in the four Inns of Court, including Middle and Inner Temple. The Temple Church was an important location in The Da Vinci Code.